The Origin of the Watershed‘s Name: “Etobicoke” derives from the native Algonkian word “Wah-do-be kaug” meaning “place where the alders grow” due to the historical abundant black alder. Etobicoke Creek is home to 286, 361 people and is about 59 km long, draining an area of 211 km2 (through the cities of Brampton, Mississauga and the City of Toronto, and the Town of Caledon. Land use in the watershed has been dramatically altered over the past 200 years and rapid changes have continued in recent decades. 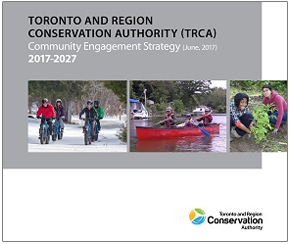 The Etobicoke Creek watershed currently consists of three major land uses, including: 27% rural, 68% urban, and 5% urbanizing. The watershed is home to 503 species of plants and animals. The vast majority of the natural cover is located within river valleys or stream corridors and represents approximately 13.8% of the watershed. Although habitat may not be continuous in some areas, the habitat patches help to provide a stepping stone effect allowing species to move north and south. These valley corridors play an important role in facilitating both resident and migrant species movement. The Origin of the Watershed’s Name: “Mimico” comes from the Algonkian word “Omimeca” meaning “resting place of wild pigeons”. The extinct passenger pigeon used the mouth of Mimico Creek as a migratory stopover. The Mimico watershed is a completely urbanized watershed within Toronto and Region Conservation’s jurisdiction, with over 30% of its landmass featuring industrial land-uses and over 60% of its reach artificially channelized. As a watershed shaped so extensively by human intervention, its management requires close attention to the protection, enhancement and expansion of its remaining natural systems and the improvement of its water quality by improving and limiting urban storm water runoff. • The Avro Arrow, Canada’s first super-sonic jet, was created in the Mimico watershed. • Humber Bay Park on Toronto’s waterfront is often mistaken as the mouth of the Humber River, but is in fact the mouth of Mimico Creek. Up until the 1970s, when the two large landfill parks (Humber Bay Parks East and West) were constructed on either side of the Mimico’s mouth, the creek flowed directly into the lake below Lake Shore Boulevard West. • Hockey Hall of Fame inductee and former Stanley Cup winning Edmonton Oilers defenseman Paul Coffey grew up in the Mimico Watershed in Malton. The airport straddles both watersheds, covering 1640 hectares of land. Most of the airport drains to Etobicoke Creek, including runways, cargo areas, Terminal Three, Terminal One aprons, and infield areas. Although runoff contamination from these sources is a concern, significant progress has recently been made to mitigate the airport’s impact on water quality through the expanded use of waste water and storm water recovery and containment systems. An esker is a long, winding ridge of sand and gravel deposited by glacial meltwaters which flowed through crevasses and channels within or beneath an ice sheet. Etobicoke Creek’s Brampton Esker is the only esker in Toronto Region Conservation’s area of jurisdiction. This community is located in Brampton, around a rehabilitated gravel pit within the Brampton Esker. These old pits provide excellent opportunities for community enhancement, recreation, and fish and wildlife habitat. Heart Lake is a kettle lake, meaning it was formed during the Wisconsin glacial period over 10,000 years ago when blocks of ice trapped under glacial overburden melted, causing a natural, steep-sided depression on the earth’s surface. Heart Lake, located in the City of Brampton and the Etobicoke Creek watershed, is the centerpiece of the TRCA’s Heart Lake Conservation Area and offers many opportunities for outdoor recreation. Teapot Lake is another glacially formed kettle lake located in the Etobicoke Creek watershed within the Heart Lake Conservation Area. This lake is unique in southern Ontario because it is meromictic, which means that the deeper waters in the lake are stagnant and never mix to the surface to become re-oxygenated.